Slippage, 2016. Watercolor on paper, 30 x 41 inches. Apophenia, 2016. 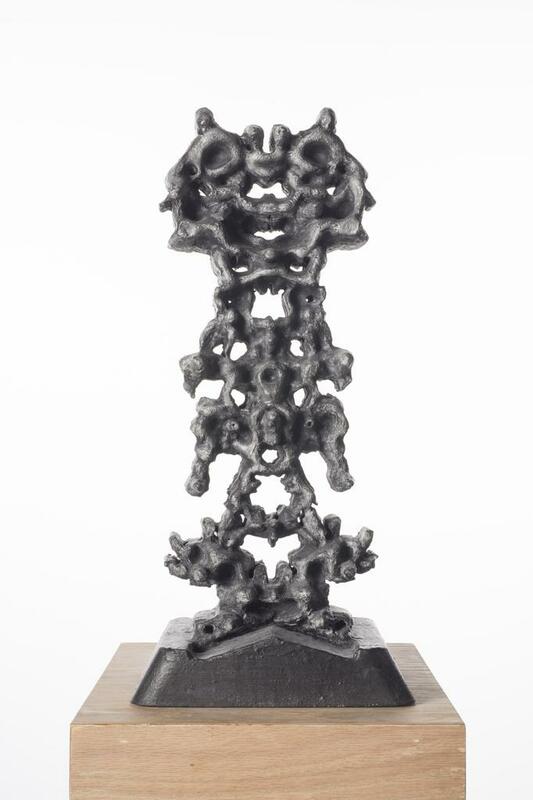 PLA polymer, acrylic, and graphite powder, 15.5 x 7 x 5.3 inches. Hypothalamus, 2014. Watercolor on paper, 39 x 41 inches. Mammillary Body, 2015. Graphite painting on paper, 22 x 15 inches. Colette Robbins from Alex Amoling on Vimeo. 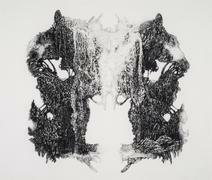 101/EXHIBIT is pleased to announce a solo exhibition by gallery artist Colette Robbins. Entitled Archaeological Fiction, the opening will be held from 7-9pm on Saturday, September 10th. 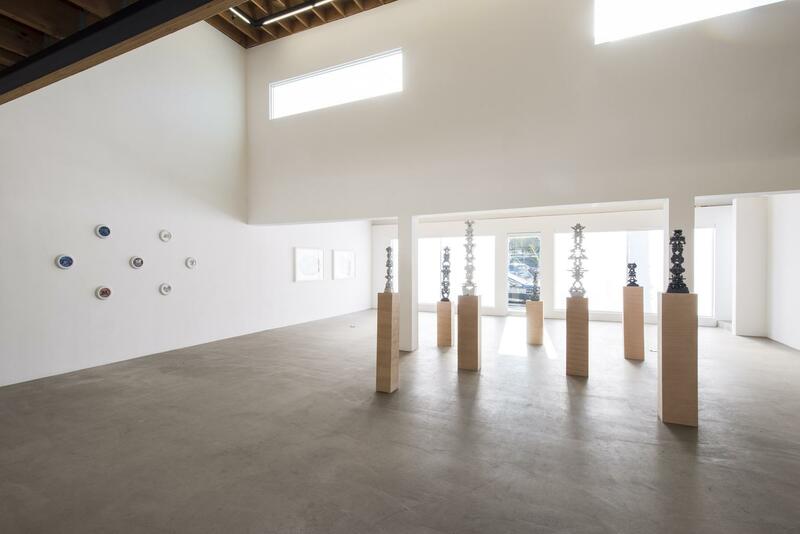 This is the artist’s first solo showing with the gallery and her first in Los Angeles. 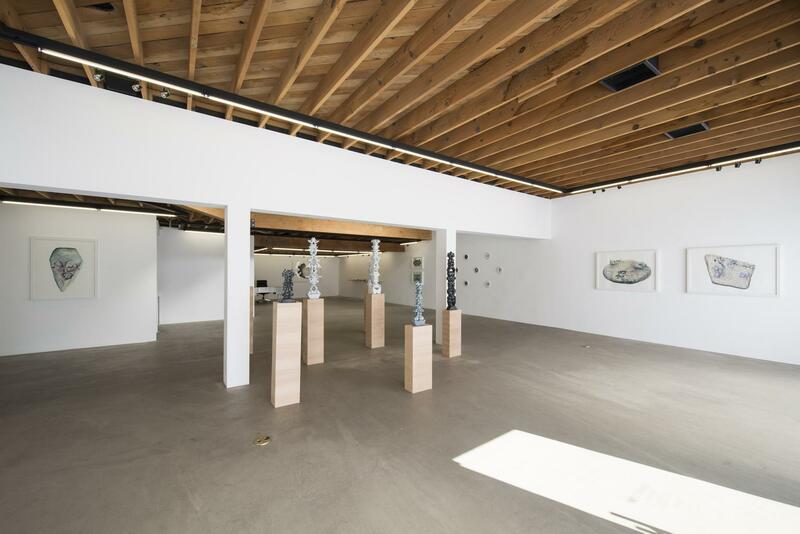 The exhibition will run through October 20th at 668 North La Peer Drive located on the southeast corner of the Santa Monica Blvd and N La Peer Drive intersection. A full-color exhibition booklet with essay by San Francisco-based writer and curator Anna Nearburg will accompany the exhibition. 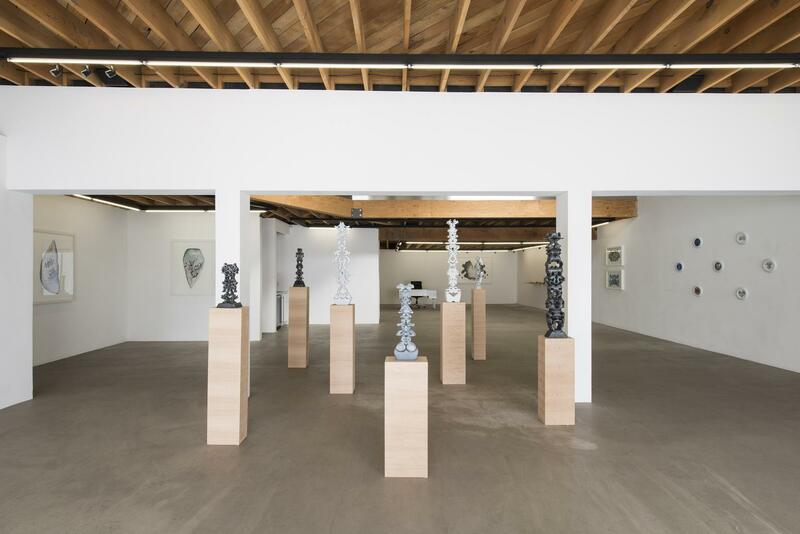 For our kick-off show of the fall season, Colette Robbins will present a new group of graphite and watercolor paintings, and numerous medium-scaled totem sculptures that are the culmination of a seven-year “psychological dig”. 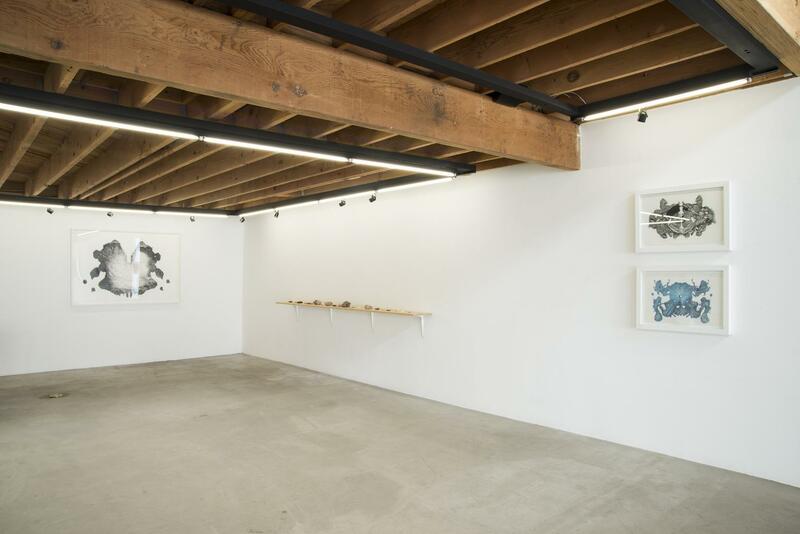 Self-referential in effect, the artworks evolved along a developmental path that fluctuated back and forth between traditional art-making methods and cutting-edge digital technology. Robbins is forthright in her use of technology to develop a means to an end, an attitude that embraces computer hardware and software as a natural enhancement to traditional art’s limitations. Robbins first became known for her graphite paintings depicting two-headed monoliths, situated in landscapes, which portrayed mysterious monuments of couples from a fictitious history. After a trip to Ireland in 2010, where she visited the National Museum of Ireland – Archaeology, Robbins came across the prehistoric Tricephalic Head from Corleck, County Cavan, Ireland dated to the 1st Century CE. This gender ambiguous three-faced stone sphere provoked Robbins’ observation of a significant lack of ancient and contemporary monuments, statues, or artifacts that memorialize personal relationships. Rather, the ancient world is predominantly occupied with depictions of singular males or females of significance. 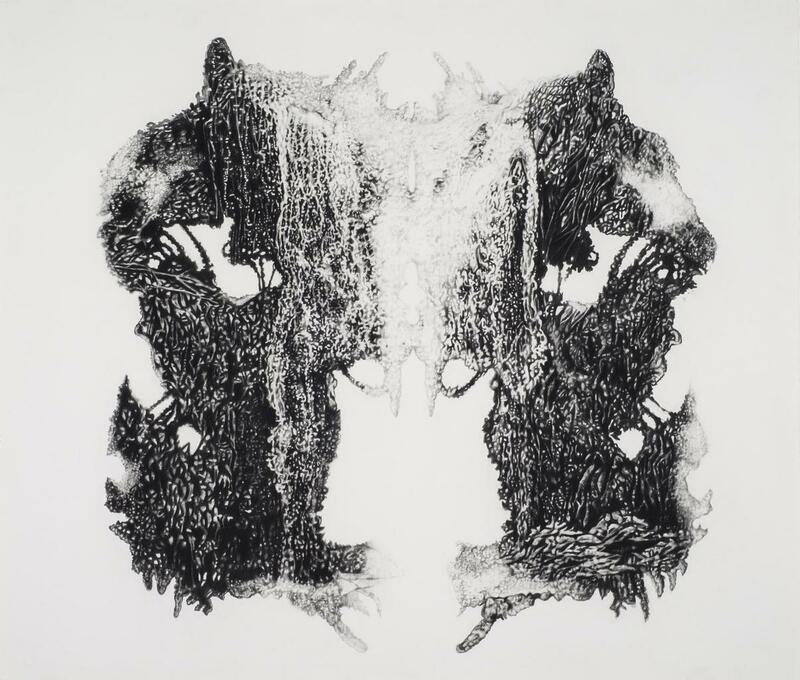 Formally, the bicephalic monoliths in Robbins' depictions began to dissolve visually over time for her into symmetrical abstract shapes akin to the familiar Rorschach inkblot. The ensuing body of work from 2014 then utilized the Rorschach as a basis to produce a new series that explored the need for humans to prescribe agency to symmetrical abstract forms. This is when the greater range of rudimentary to highly developed artistic practices began to meld within Robbins' practice. She employed something as simple as folding paper to make inkblot images and imported them into complex digital software for manipulation. The blots were enlarged and imbued with suggestive landscape references, to be rendered by hand, back onto paper as graphite paintings. These works were simultaneously abstract and representative in nature. 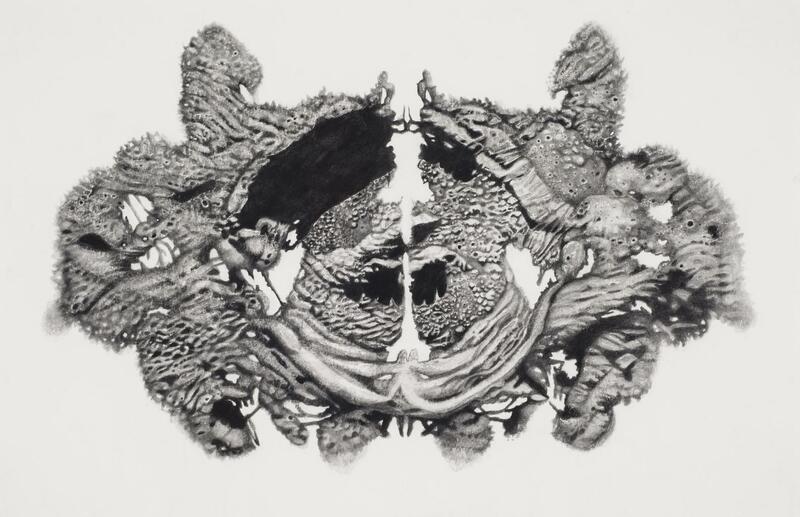 Further on to this current body of work then, the Rorschach device stood well so long as it rested within the 2D. 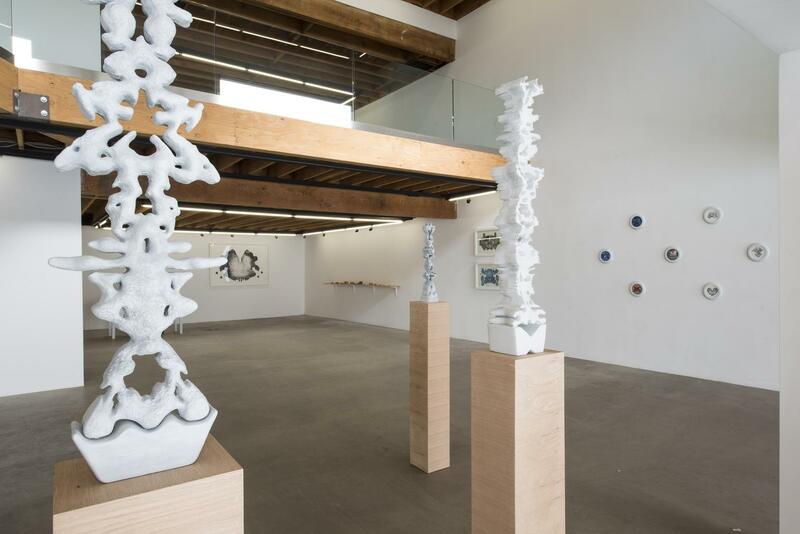 Aesthetically, the formal properties complimented Robbins' geological and archaeological concerns, but expectedly they also provoked self-reference. The utilitarian aspect of the Rorschach relies upon pareidolia, the psychological phenomenon involving a stimulus (rock or cloud, for instance) that evokes a recognizable image or pattern where none actually exists. This became the crux of Archaeological Fiction. “Archaeology” in the case of this exhibition is an umbrella term for the historical evolutionary phenomenon of humanity’s need for belief systems. Mythology, symbolism, religion, politics, the occult, superstition, and conspiracy theories are elements of the greater cultural idea of mental health. Considering that any given Rorschach is intended to yield a glimpse into one’s psyche, a number of combined Rorschach tests might begin to develop more of a personality profile. 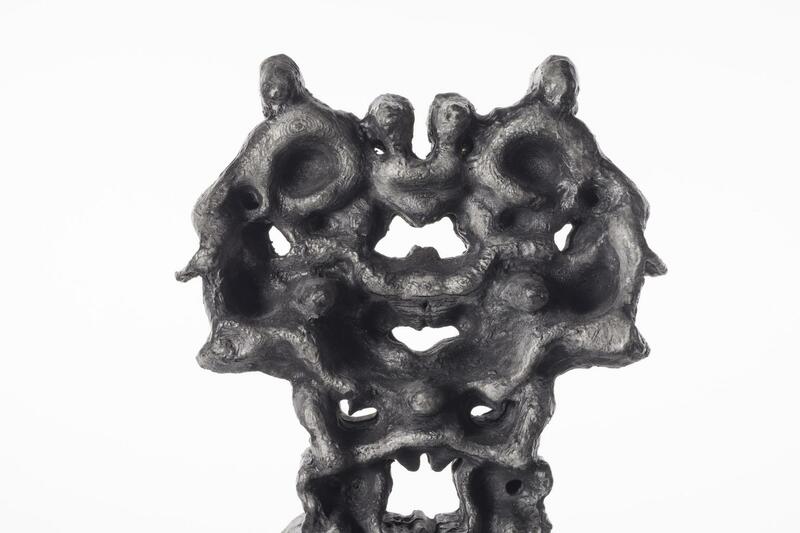 Desiring to manifest this profile, Robbins chose to extrude the 2D Rorschach blots into 3D forms using ZBrush (a digital sculpting tool), combined them into a vertical totem sculptures, and finally digitally 3D printed them. 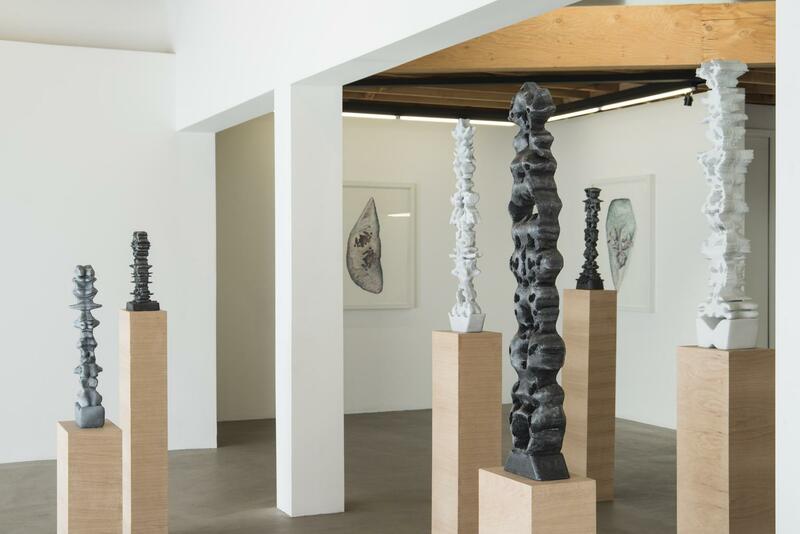 This exhibition will feature a total of seven of these enigmatic sculptures, which are finished with a graphite coating. Finally, rounding out the presentation, Robbins' personal collection of rocks and minerals were photographed and digitally manipulated to create paintings of fossilized relics from a fictional past. 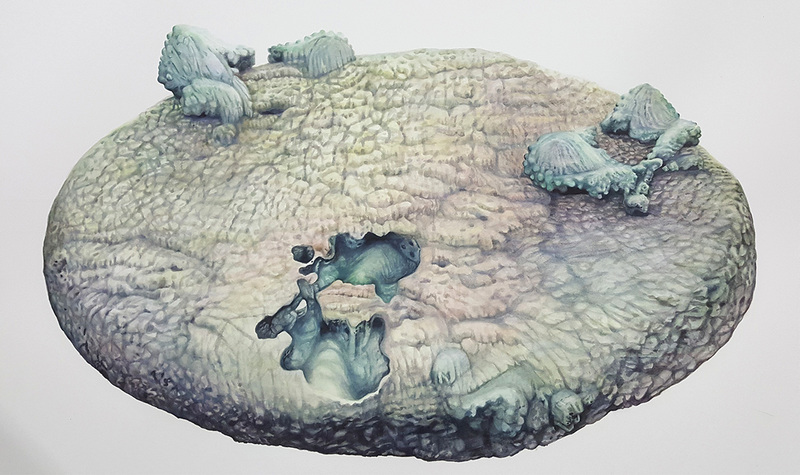 Each watercolor work was rendered from a digitally prepared source file that features her Rorschach imagery etched into the surface of these rocks as fossils from an unidentified universe. Functioning as mimetoliths, these paintings mimic recognizable forms in rocks that seem to have developed through the random processes of formation, weathering, and erosion. The end result is something that feels natural at the onset, but upon extended viewing, becomes eerily suggestive of something more deliberate and alien. Colette Robbins is a NYC-based artist. She received her MFA from Parsons, the New School for Design in New York City and her BFA from Maryland Institute College of Art in Baltimore, MD. 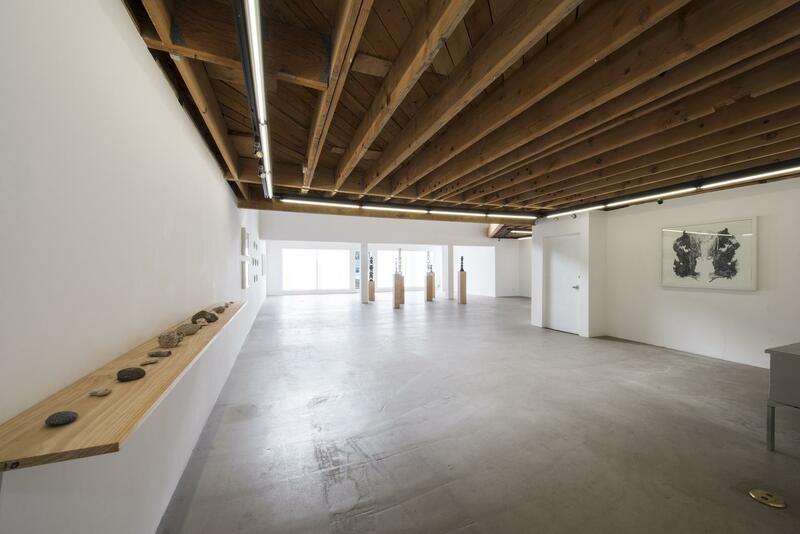 Robbins has exhibited her work nationally and internationally; at The Hole Gallery in New York, P.P.O.W. in New York, Deitch Projects in New York, Kirk Hopper Gallery in Dallas, Koki Arts in Tokyo, and Workshop Arte Contemporanea, Venice, Italy. Residencies and awards include Austevollportalen, Bergen, Norway, 2013; Cill Rialaig Project, Ireland, 2010; The Vermont Studio Center, 2008. Robbins has held numerous teaching positions since 2007 and currently serves as Assistant Adjunct, Drawing, Painting, Advanced Studio Art at Hofstra University, Long Island, NY. 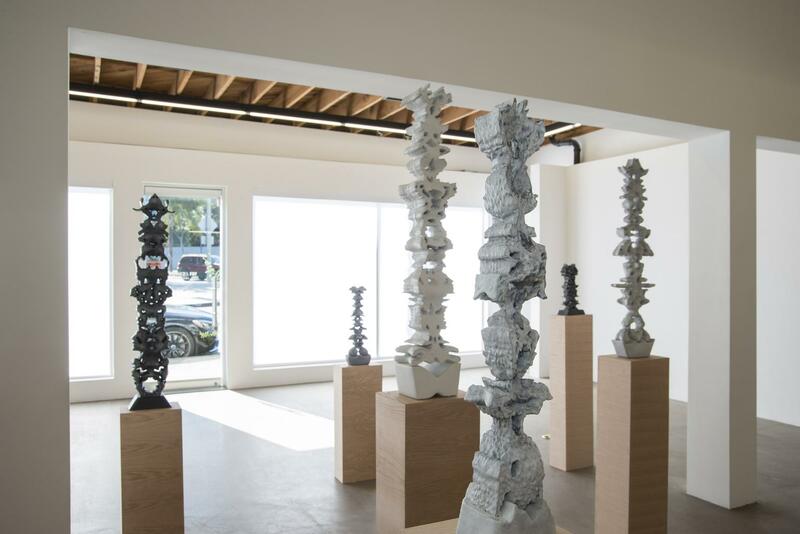 Show Review in Artillery Magazine, by Anastasia Kahn. Archaeological Fiction has been included in ARTINFO's Datebook.